20th century commercial artist, graphic designer, filmmaker and photographer. Born in Hamilton, Queensland on 10 November 1905, the second son of Ernest Ewart Collings, General Store Keeper and Grace Lee Collings (nee Chalk). Geoffrey studied art at the Brisbane Technical College, from 1919 until 1922, before taking his first job with George N. Orr’s Advertising Agency, Brisbane’s first agency. He then worked for the engraving firm SA Best, learning the printing technique of process engraving. Following the death of his mother in 1924, Geoffrey Collings left Brisbane and travelled north, working as a Jackaroo on remote cattle stations in North Queensland and the Northern Territory. He returned to Brisbane in 1927, spending the next three years working as a freelance commercial artist and graphic designer. In 1930 Geoffrey travelled to London where he gained employment with the book distributers WH Smith and Sons and became Assistant Studio Manager of Typography and Graphics because of the printing experience he had acquired in Brisbane. Geoffrey took night classes in drawing and painting at St Martins School of Art and etching at the London Central School of Art and Design, where he met many fellow Australians including William Dobell and Nell Wilson. At this time Geoffrey developed an interested in photography and purchased a press camera ‘to record what I was going to experience’. In 1933 he returned to Australia via Spain. On returning to Australia, Geoffrey settled in Sydney and set up Collings Studio, as a designer to industry. While looking for a studio assistant he met his future wife, a graphic designer named Dulcie May Wilmot, whom he nicknamed Dahl. On 15 December 1933 they were married in Sydney and began a lifelong working collaboration, co-signing their work ‘Dahl and Geoffrey Collings’. In 1935 Geoffrey returned to London with Dahl, taking a position as the Art Director at American advertising agency Erwin Wasey. Through Dahl’s work he met Professor Laszlo Maholy Nagy and György Kepes from the Bauhaus. The Bauhaus principle of form follows function appealed to Geoffrey, particularly because of his Fabian Socialist upbringing. Maholy Nagy’s all-inclusive eye was especially enlightening for Collings; he recalls being impressed by his complete desire to get at the truth, the core of everything. ‘I’ve seen him stop in a new building and touch the carborundum spots that stopped people slipping on elevator steps. The seeing blind had walked over them’. During this time he was also exposed to the ideas of the British Documentary film movement, after coming into contact with John Grierson. Documentary film provided Geoffrey with a means to show life as it really was; in a 1992 interview he revealed that he ‘always hoped I would make the world a happier more peaceful place through my work’. The European influence would change the direction of his work completely, encouraging him to work collaboratively with other artists and designers and to work across various mediums and disciplines. During a trip to Spain between 1935 and 1936 he made his first documentary film with his wife Dahl, Alquezar was a film about agrarian life in an isolated medieval Spanish village situated high in the Spanish Pyrenees. It was completed just before the outbreak of the Spanish Civil War. Geoffrey’s passport shows that he left Spain with his wife on 10 June 1936, only five weeks before the outbreak of the Civil War on 17 July 1936. The film was widely distributed in England by the anti-Franco group, the International Brigade to recruit support for the anti-Franco campaign. Whilst living in London, Geoffrey and Dahl made trips to Europe with their still and film cameras in hand, visiting Spain, France, Italy and Switzerland. In 1937 his first daughter Donna Collings was born. Encouraged by his friend György Kepes, he sent a selection of photographs to Eva Besny’s exhibition Foto 37 held in Amsterdam at the Stedelijk Museum in 1937, however the catalogue appears to indicate that his photographs were not chosen. Shortly before departing for Australia in 1938, he held a small exhibition Three Australians, of photography and commercial art at the Lund Humphries Gallery in London with his wife Dahl and friend Alistair Morrison. On his way home he stopped in Tahiti, where he and Dahl made their second film Tiare Tahiti, which was never finished. After his arrival in Australia in November 1938 he established the Design Centre in Sydney with his wife Dahl and fellow artist and designer Richard Haughton James. Inspired by the Bauhaus principle of reintegrating art and design, Collings aim was to introduce Australia to European trends in art and design and to establish a commercial art firm that functioned through mutual support and collaboration. In 1939 Geoffrey and Dahl exhibited a large selection of photography and commercial art from their time in Europe at the David Jones Art Gallery, Sydney titled An Exhibition of Modern and Industrial Art and Documentary Photos. In 1940 his second daughter Silver Collings was born. During the same year Collings was appointed Art Director at Woman magazine but WWII forced him to the abandon the job to join the Department of Defence Camouflage Unit. While stationed in North Queensland he made a series of paintings and gouaches which he exhibited in his first solo exhibition in 1943 at the Macquarie Galleries, Sydney. The early 1940’s saw Collings lobby the Australian Government to establish a National Film Board. In 1941 he published the booklet The Use of Film in Wartime; he believed that public service films could be used to reassure and invigorate a nervous public who were suffering under strict WWII austerity measures. He produced his first commissioned film Airstrip in 1944 for the Allied Works Council. In 1945 Collings seized the opportunity to develop his skills as a film maker by taking the job as assistant director to Harry Watts on the Ealing Studios film The Overlanders, a drama about the scorched-earth policy of WWII. In 1945 the Australian National Film Board was established and Collings worked there as a director and producer from 1946 to 1949. There he made a number of films, including Watch over Japan, (1947) and Whither Japan, (1947) which recorded Australia’s contribution to the reconstruction of Japan after its defeat in WWII. Geoffrey and his family moved to New York in 1950 when he was appointed Picture Editor at the United Nations. In 1954 he returned to Australia and founded Collings Productions Pty Ltd with his wife Dahl. 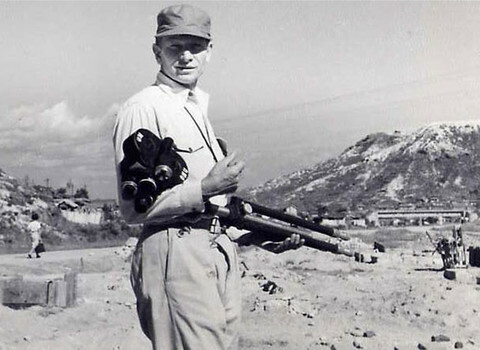 He then spent five months in Korea with the UN and the Korean Reconstruction Agency making The Long Journey, (1954). Like the Japan films, this film documented the Allied Forces role in Korea’s post war reconstruction. Throughout the 1950s and 1960s he went on to write, produce and direct 42 films for firms such as Qantas, Shell and CSR. Many of these won national and international awards, including The Dreaming (1963) and Pattern of life (1964) which both won Special Diplomas at the Venice Biennale Festival of Art Films, 1964. Geoffrey and Dahl Collings retired and moved to a home designed by Peter Storey, in Killcare Heights, NSW in 1970. While Dahl painted, Geoffrey made assemblage paintings and sculptures. In 1992 Geoffrey and Dahl Collings’ work was included in the Pioneers of Design exhibition at the Ivan Doherty Gallery, Sydney. Geoffrey Collings died in 2000. Geoffrey is represented in a number of Australian collections including the Museum of Applied Arts and Sciences, Sydney, The National Film and Sound Archive, Canberra and the National Gallery of Victoria, Melbourne. Biography prepared by Helena Lucey, Curatorial Intern with Anne-Marie Van de Ven Curator, October 2012.